We believe an iconic setting has the power to foster legendary ideas. 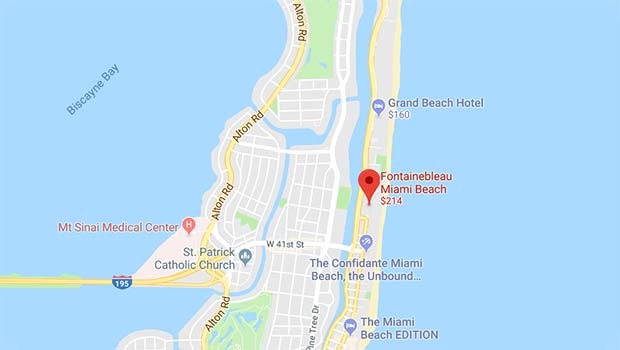 Introducing Fontainebleau, one of the most historically and architecturally significant hotels in Miami Beach, Florida. From boardroom to boardwalk, this oceanfront hotel boasts 22 acres of resort-style luxury. State of the art conference and meeting spaces are complemented by an endless poolscape, miles of beach, a two-story spa, four lounges and bars and award-winning dining options. Fontainebleau is a blend of stylish modern luxury and Miami’s glamorous golden era. A revered Miami Beach landmark for more than half a century, Fontainebleau sets a new standard for business as pleasure. The negotiated conference room rate is $369 + tax per night. Rooms can be requested during registration. Warning: We have received reports that third-party housing scammers are attempting to reach out to attendees posing as the official hotel booking agency for Deluxe Exchange 2019. These companies are in no way affiliated with Deluxe Exchange or Deluxe Corporation. To protect yourself from fraud, please book your hotel reservation during the registration process on our registration website.